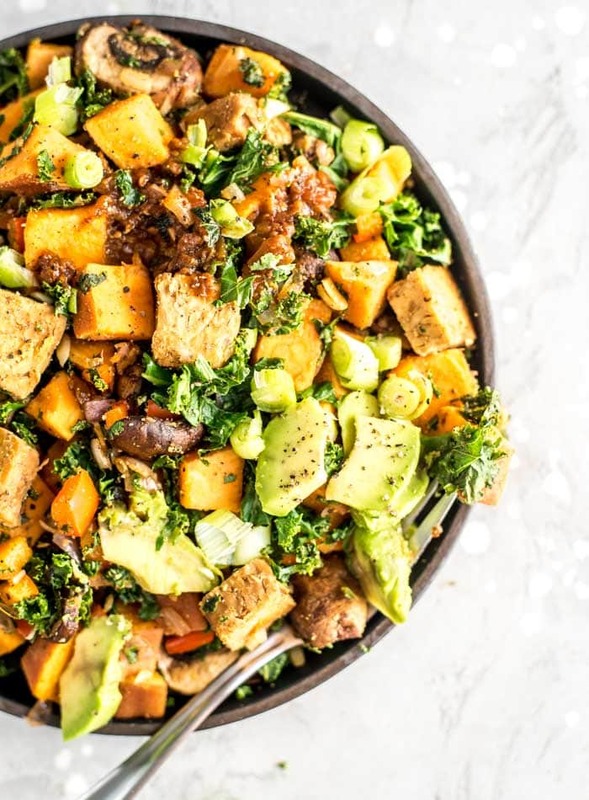 This quick vegan sweet potato breakfast hash with tempeh comes together in just 15 minutes. The cooking time is reduced by giving the sweet potatoes a quick boil before adding to a skillet with tempeh and veggies. This recipe is gluten-free, oil-free, sugar-free, customizable, high in protein and fibre and can be made in advance and re-heated for an even quicker breakfast. 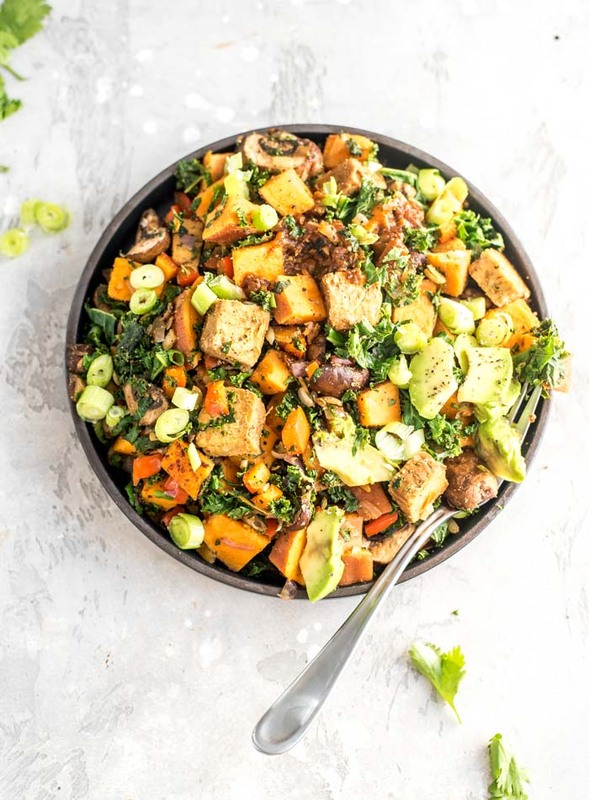 You can pretty much use any vegetables you want to make breakfast hash but my favourites are mushroom, zucchini, bell peppers, kale or spinach, onion and garlic. To switch it up, I’d recommend keeping the onion and garlic in the recipe for flavour and using some greens such as kale or spinach, then customizing the rest as needed. For this recipe, I’d used 1/3 cup minced red onion, 2 cloves of minced garlic, 2 cups chopped kale and about 1 cup of sliced mushrooms and diced bell peppers. You can sub out the mushrooms and bell peppers for other veggies or add to it with diced zucchini, green peppers, grated carrots or anything else you can think of. You could also make it with roasted squash or white potatoes instead of sweet potato. I added cubed tempeh to the hash to bump up the protein and create a more balanced dish. If you don’t have tempeh or want to switch it up, try a chopped Field Roast Sausage, other vegan sausage, seitan or serve the hash alongside tofu scramble. If you use tempeh like I did, you’ll be getting in 25 grams of plant-based protein to start the day. Vegan sausage would add about the same amount. If you’re unsure what plant foods provide protein, check out my post on the best vegan protein sources. There are a few different ways you can go with the spices for this dish. I like garlic powder, cumin, salt and pepper. Smoked paprika is really good too. These are the spices you’ll find listed in the recipe. You can go with a Southwest-flavour and add some chili powder and onion powder along with the cumin, paprika and garlic powder or go with curry-inspired flavours and add a bit of curry powder and turmeric. You can also just keep it simple and use salt and pepper or you can use herbs like parsley, basil and oregano. Fresh herbs are lovely too, try topping the finish dish with some chopped fresh dill, chives or cilantro. 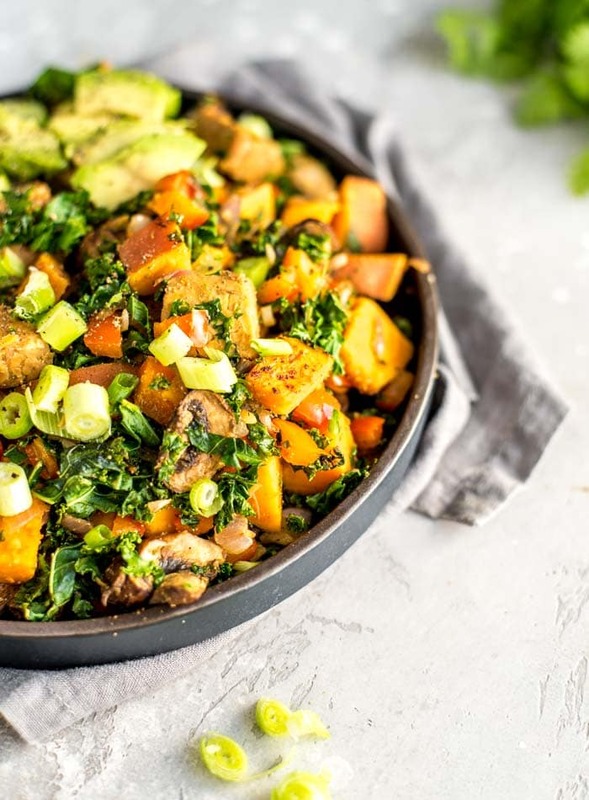 I actually like adding in a big handful of fresh chopped cilantro with the kale and sweet potato so it softens up a little. As much as I love starting the day with a sweet breakfast like oatmeal or pancakes, I know a savoury one is a better choice for me. 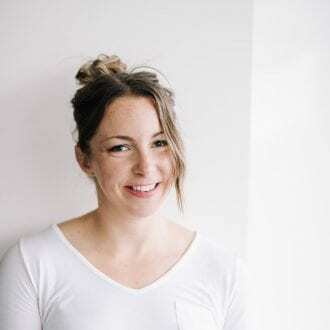 I crave less sugar and stay fuller longer and because high-fibre, protein-rich dishes with some added fat help keep my blood sugar levels more stable. I have more balanced energy throughout the morning when I choose savoury over sweet. You can read more about this in my post on hunger and blood sugar. I always crave something carby and sweet in the morning but as soon as I sit down to eat this, I couldn’t be happier about my choice. It’s just making the first initial decision to choose veggies over oats and pancakes. These days, I try to save oatmeal, smoothies and pancakes for the weekend to enjoy as a special treat. I would recommend starting most days with a high-fibre, veggie-packed breakfast that has some protein and fat in. 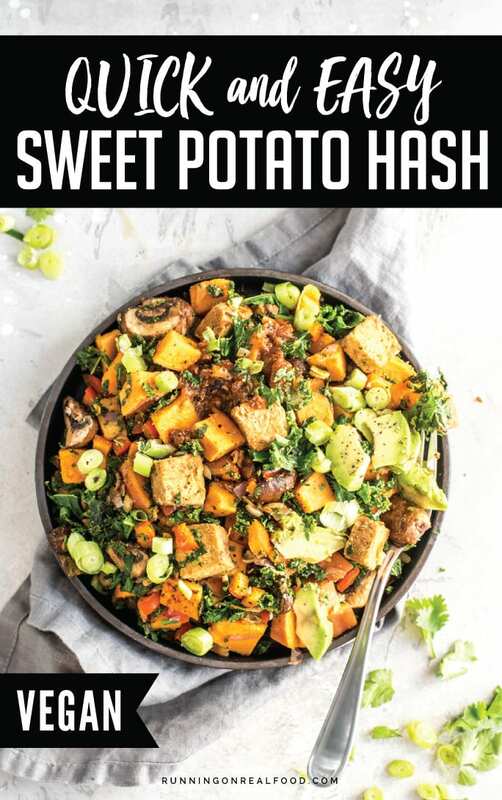 This breakfast hash comes together in under 15 minutes including chopping and prep. 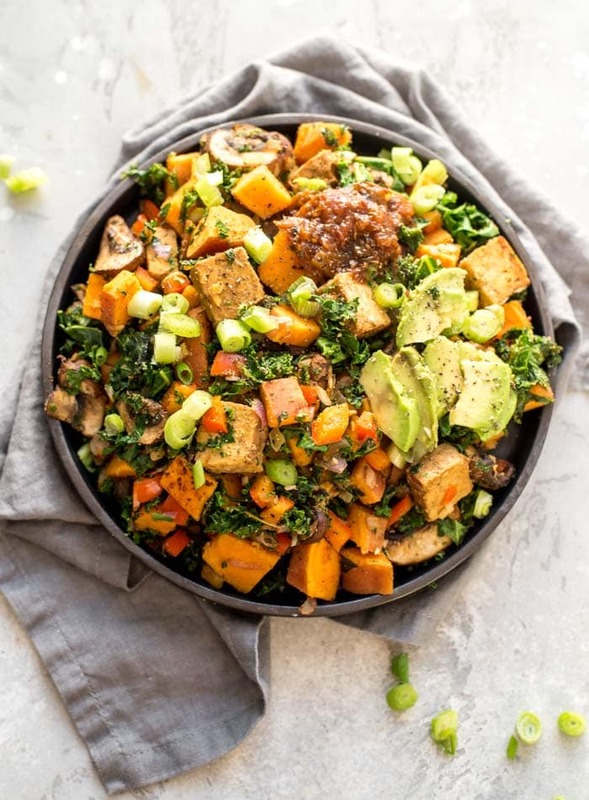 Boil the sweet potato (or regular potato), fry up the veggies and tempeh, then add the cooked sweet potato in, cook for a few more minutes and serve. 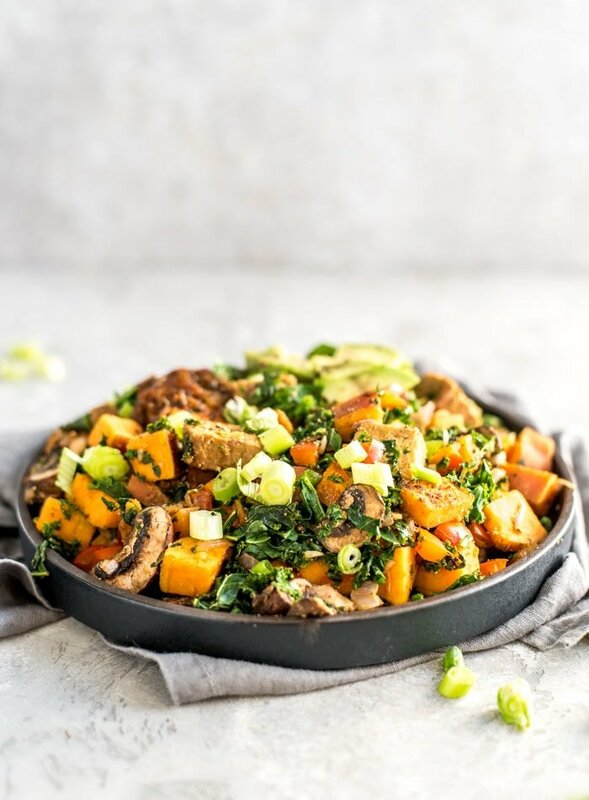 For an even faster breakfast skillet that’s made without sweet potato and tempeh, you can try my Easy Vegan Breakfast Skillet. To make this for meal prep, simple double or triple the recipe, cook the whole dish in advance and then re-heat in a pan stovetop on in the oven as needed throughout the week, topping with avocado just before serving. This recipe serves one and provides 408 calories with 65 grams of carbohydrates, 8 grams of fat and 25 grams of protein. You’ll also be getting grams of 12 dietary fibre, more of your daily vitamin C and vitamin A (beta-carotene) and about 20% of your daily iron and calcium requirements. This recipe is also a source of probiotics if you use the tempeh and provides a range of other essential vitamin and minerals such as magnesium and B vitamins. An easy, hearty, sweet potato breakfast hash with tempeh and veggies. This breakfast is satisfying, flavourful, full of nutrition and will keep you full for hours. Bring a pot of water to a boil then add the cubed sweet potato and boil for 8 minutes. Drain. 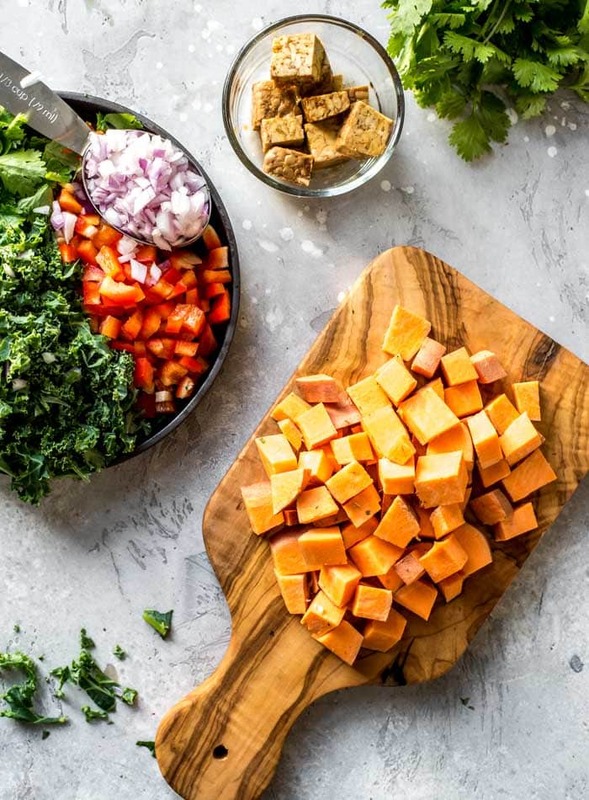 While the sweet potato is cooking, add all of the other ingredients except for the kale to a frying pan and start cooking over medium-high heat. Cook and stir for about 6-7 minutes until everything is starting to soften and brown. Add the drained sweet potato and kale to the pan cook for another 5 minutes. Only stir it a couple times so it can sit in the pan and brown. Once cooked, add to a plate or bowl, top with avocado, salsa and green onion and season with additional salt and pepper, if desired. It’s really good with some melted vegan cheese too. To add a more flavour to the tempeh, marinade in a splash of soy sauce or gluten-free tamari, balsamic vinegar, garlic powder, sea salt and pepper for 30 minutes up to overnight. Even just 10 minutes with some soy sauce does the trick in a pinch. Your SWEET POTATO BREAKFAST recipe is very teasty and healthful breakfast. We used this recipe in our menu, Our clients like it so much. Thanks for the recipe.